It's Mosaic Monday again.....how did the time fly by so fast??? Join everyone over at Little Red House for all the beautiful mosaics. What a good idea this was for a mosaic. I need to think outside the box more. Wonderful mosaic and very colorful. 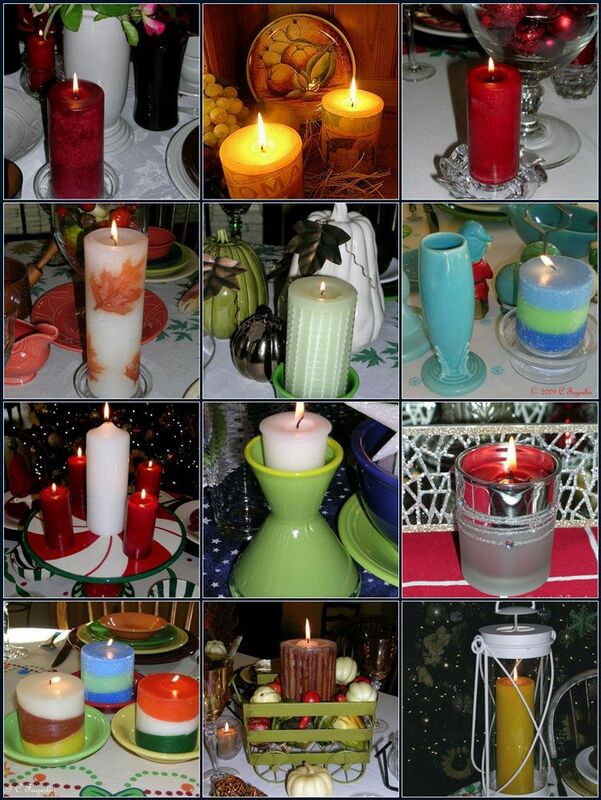 I see I am not the only person crazy about candles. What a great idea for a mosaic! Love it. What a unique mosaic and so colourful, Happy New Year, Kathy. What a gorgeous candle themed mosaic. Lovely. Candle light has such a warm feeling. You have some great candles! Love the one with the fall leaf on it! What a great idea for the mosaic...love that! Thanks everyone! I think a good lesson to be learned from all these holiday candles ..... candles can make the most mundane table feel special. Something about that soft glow just makes everything sparkle. Lana, that leaf candle came from Pier 1 last fall and I saw them on sale last week! Ohhhhhh, you're speaking my language - CANDLES! Love them - nicely done. Very clever mosaic idea! Have a happy week! Thanks ladies, I'm thinking I need to figure out something clever to do with all these leftover candles from the holidays.